The Egyptian civilization that arose along the banks of the NILE RIVER in ancient times was one of the longest-lasting in world history. For nearly 3,000 years, Egypt dominated the northeastern corner of Africa. The ancient Egyptians interacted with the peoples of the Near East and the Mediterranean. At the same time, they traded goods and maintained relations with groups in sub-Saharan Africa. Ancient Egypt developed along the valley of the Nile River, stretching from present-day SUDAN in the south to the river’s broad delta on the Mediterranean Sea. The SAHARA DESERT flanked the valley on the east and west. The Egyptian population was concentrated in three regions: Lower Egypt, the northern area around the Nile delta; Upper Egypt, the river valley between the delta and Sudan in the south; and the Fayum Depression, a well-watered lowland west of the delta. The Nile River supported and nourished the civilization of ancient Egypt. It served as a major transportation route and a source of fish, an important element of the Egyptian diet. The greatest benefit of the river, however, was its annual flooding. Every year, the Nile’s floodwaters soaked the valley and deposited nutrient-rich mud and sediment, making the soil fertile and arable. Agriculture was the backbone of the Egyptian economy. The principal food crops were wheat, barley, and legumes such as beans and lentils. From these, Egyptians made bread, porridge, and beer. Flax and papyrus were also important crops, grown in the wetland areas of the Nile. Flax was used to make rope and textiles, and papyrus was processed into a paperlike writing material of the same name. Historians divide ancient Egyptian history into three general periods called kingdoms. During these kingdoms and the times of turmoil and instability that separated them, Egypt was ruled by more than 30 dynasties. Egyptians believed their rulers to be embodiments of the god Horus, and they honored them as divine as well as royal. After their deaths many rulers were worshiped along with the gods and goddesses of the Egyptian pantheon. From the time of the Eighteenth Dynasty (about 1529 B.C. ), Egypt’s rulers—usually kings but occasionally queens—were known as pharaohs. Egypt’s earliest inhabitants were nomads who hunted, gathered, and fished for wild foods. During the 5000s B.C., immigrants from western Asia introduced agriculture to Egypt. Agriculture opened the way for the formation of settled communities—first villages and later small kingdoms. Around 3000 B.C. Menes, a king in Upper Egypt, conquered Lower Egypt and unified the country, founding the first dynasty. The rise of the Third Dynasty around 2675 B.C. marked the beginning of what historians now call the Old Kingdom. By this time several key features of the ancient Egyptian civilization had appeared. Egyptians had a written language using characters called hieroglyphs, a system of record keeping, and a strong and wealthy central government. 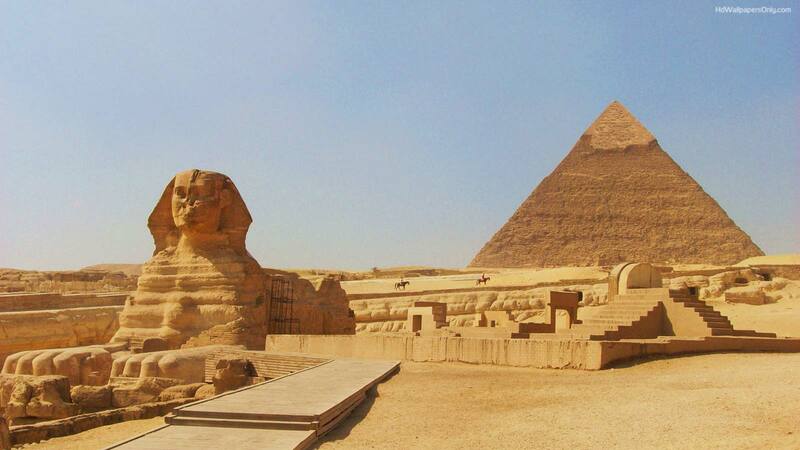 They mastered the art of building great monuments in stone, including the famous PYRAMIDS. For this reason, the Old Kingdom is often called the Pyramid Age. This era ended around 2130 B.C., when Egypt’s central government fell apart amid social unrest. Decades of civil war followed, as rival dynasties fought for control. The Middle Kingdom began with the Eleventh Dynasty around 1980 B.C. During the Middle Kingdom, Egypt traded with states of the ancient Near East that bordered the Mediterranean. The Egyptian kings expanded their control into NUBIA, the land south of Egypt. Art and literature flourished. However, around 1630 B.C. invaders from western Asia conquered Lower Egypt, bringing the Middle Kingdom to an end. Almost 100 years later, Ahmose, the first king of the Eighteenth Dynasty, overthrew the invaders and reunited Egypt. The reunification ushered in the New Kingdom, which lasted until around 1075 B.C. The years of the New Kingdom were the country’s longest period of strong central government. Egypt became wealthier and more powerful than ever, controlling not only Nubia but also territory in what is now Syria. Some splendid and well-known relics of ancient Egypt, including the tomb of the pharaoh Tutankhamen, date from this period in Egyptian history. The New Kingdom ended in disorder as minor local kings arose and divided the country among them. Egypt also came under foreign pressure. Libyans from the west and Nubians from the south took over parts of Egypt. In the late 600s B.C., Egypt fell under the rule of the Assyrian Empire, based in present-day Iraq. Later it was conquered by the Persian Empire. From time to time Egyptian kings succeeded in uniting their land, but these periods of native rule were brief. In 332 B.C. Alexander the Great, ruler of Macedonia and Greece, took control of Egypt. After his death Ptolemy, one of his generals, established Egypt’s last royal family, the Ptolemaic Dynasty. For several centuries Egypt was part of the Hellenistic world. ALEXANDRIA, a city founded by Alexander on the Nile delta, became famous as a center of scholarship. The Ptolemaic Dynasty ended in 30 B.C. with the suicide of CLEOPATRA, Egypt’s last pharaoh. By that time Rome had replaced Greece as the dominant power in the Mediterranean world, and Egypt remained under Roman rule throughout the remainder of the ancient era. Religion shaped every aspect of Egyptian culture and daily life. Little is known about the everyday religious lives of ordinary people. However, royal tombs, monuments, and temples have preserved a wealth of detail about ancient Egypt’s official state religion. One key element of this religion was the belief that the gods would protect Egypt as long as the king served them faithfully. The king was responsible for the upkeep of temples and for performing certain ceremonies. Another important part of Egyptian religion was the belief in a life after death. A number of religious practices were designed to prepare the dead for this afterlife. One was mummification, a process by which the bodies of the dead were chemically treated to resist decay. Another custom was to bury in tombs objects that people would need in the afterlife, including food, utensils, and furniture. Written texts—such as the Book of the Dead—were also buried with individuals to guide their souls on their journeys after death. Such tombs have provided archaeologists with much of what is known about ancient Egyptian society and thought. One of ancient Egypt’s greatest achievements was its architecture. The pyramids, mostly built during the Old Kingdom period, demonstrate that the society that constructed them possessed a high level of mathematical knowledge and accurate surveying and measuring skills. The Sphinx, another famous symbol of ancient Egypt, shows a mastery of large-scale sculpture. This massive statue of a man’s head on a lion’s body probably represents King Khufu of the Fourth Dynasty. Egyptian culture also found expression in wall paintings, in oral storytelling, and in texts. After modern scholars learned to read hieroglyphs, they deciphered a vast number of Egyptian writings on papyrus scrolls. The works covered a wide range of subjects, from autobiography to astronomy, and included poems, letters, stories, myths and fairy tales, and political and religious writings. Although isolated from the rest of the continent by stretches of desert, Egypt was part of the African world. Its language belonged to the Afroasiatic language family, blending elements of Semitic and North African languages. Scholars are now debating what ethnic groups the ancient Egyptians belonged to. The many surviving portraits show that the Egyptians were more closely related to Semitic and west Asian peoples than to black Africans. Also, in their art, Egyptians portrayed blacks as distinctly different from themselves. Most research into the connections between ancient Egypt and sub-Saharan Africa focuses on two issues: the origins of the Egyptian people, and the relationship between the Egyptians and the rest of the African continent. Ancient Egypt and sub-Saharan Africa met in Nubia, a region now divided between southern Egypt and northern Sudan. There Egyptian influences blended with those of the indigenous peoples of the Nile River valley. By about 4000 B.C., communities in the Nile delta and the Fayum had developed a culture based on farming that was distinct from the culture of the Nile River valley peoples. In the centuries that followed, agriculture became more widespread in Upper Egypt, and a civilization that modern historians call the Nagada culture developed there. Archaeologists have found cemeteries with royal burials, ceramic pottery, and carvings in bone and ivory in this region. The Nagada culture eventually spread northward and took over the delta and Fayum communities, unifying Egypt. As the Egyptian state was taking shape, Nubian culture was developing as well. Aswan was long thought to have been a “frontier” between Egyptian and Nubian regions. However, modern research suggests that the two cultures were quite closely connected. For example, archaeologists have found pottery that shows that the Nubian and Nagada communities often traded with each other. Some historians believe that a state similar to the early Egyptian state arose in Nubia by around 3100 B.C. After Egypt was unified, Egyptians continued to trade with the Nubians for ivory, animal skins, and other goods. Around 2900 B.C., Egyptians began building forts in northern Nubia and raiding the region for slaves. The early Nubian communities disappeared, possibly as a result of slave raids. But by 2400 B.C., northern Nubia had been repopulated and new villages stood along the banks of the Nile Valley. Farther south, beyond the area of Egyptian control, Nubia developed a civilization of its own around the city of Kerma. For nearly 900 years, Kerma was one of the most advanced states in sub-Saharan Africa. During the New Kingdom, Egypt expanded southward into Nubia, destroying Kerma around 1550 B.C. The reason for the expansion may have been gold, Nubia’s most important product. Egyptian kings rebuilt the old forts in the region and constructed temples there. The pharaoh Ramses II, in particular, built several temples at Abu-Simbel and other Nubian sites. The Egyptians ruled their Nubian territory through an official called the viceroy of Kush. He and other local officials were Nubians who recognized Egyptian authority. Scholars believe that some of them probably spent time in Egypt, absorbing its culture and religion, which they then spread in Nubia. Around 1000 B.C. the Egyptians withdrew from Nubia, although they maintained at least one fort in the northern part of the region. At the same time in southern Nubia, near an Egyptian temple at Gebel Barkal, a local dynasty arose and founded the kingdom of Kush. Between 760 and 653 B.C., the Kushites conquered and ruled all of Egypt. The six Nubian rulers of the Nile River valley during this period are Egypt’s genuine “black pharaohs.” They rebuilt many old Egyptian temples and restored trade between Egypt and Nubia. Around 654 B.C., invading Assyrians drove the Kushites back to Nubia. The Kushites established their capital at Napata and continued to follow many of the traditions of Egyptian rulers. Later they moved their capital to Meroë, which was farther south and more removed from Egyptian contact.